emphasis is on proposing coherent theories rather than lingering on incoherent ones. sense, against human reason. I will briefly now reply to each of these skeptical objections. indeed difficult to see how the various other basic ideas of reason could be justified. principle could only itself be known by generalization. an epistemologically justifiable scientific methodology. See mentions in: Future Logic, chapters 65 and 67. Phenomenology, ch. I, V, VI and VII. Judaic Logic, ch. 2. Buddhist Illogic, ch. 7. The Logic of Causation, ch. 3, 10, 16 and app. 1. 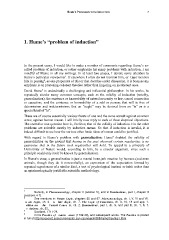 Volition and Allied Causal Concepts, ch. 2. Ruminations, part I, ch. 9, and part II, ch. 1, 6, 7.